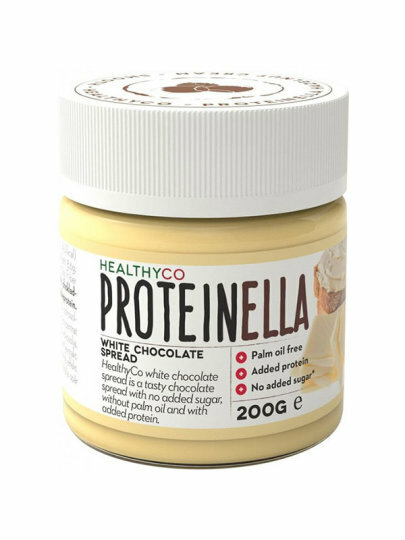 Proteinella is a protein-based cream with beneficial nutrients - protein whey, fiber and vitamins. It contains only 7.3 grams of sugar per 100 grams, without added sugar. Maltitol, which is an alcoholic sugar, is used as a sweetener - its caloric value is about 70% lower than the normal calories of normal sugar. It also has about 50% lower glycemic index than sucrose. This means it does not increase the blood sugar level as normal sugar, so Proteinella is also suitable for diabetics. Sweetener: maltitol, sunflower oil, skim milk powder (13%), whey protein concentrate (12%), cocoa butter, coconut oil, emulsifier: lecithin (sunflower).